BELMONT GARDENS — When Adrienne Blumthal started her business two years ago, it helped to think inside the box. Blumthal, 30, of Humboldt Park is the creator of PieBox, a reusable wooden pie carrier. The idea came to her in the midst of a career change, from marketing to pastry. As a night student in the pastry program at Kendall College, Blumthal churned out homework from her home kitchen while fielding a growing number of dessert requests from family and friends. "When you're in pastry school, people expect you to bring stuff. That's when I discovered the lack of available items to transport them," she said. 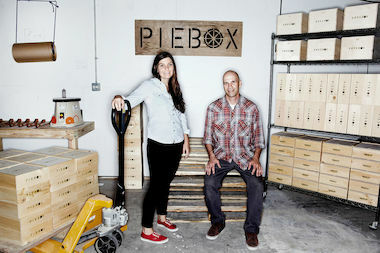 Adrienne Blumthal (l.), the creator of PieBox, stands in her Northwest Side manufacturing facility and warehouse with her photographer husband Steve Metzer. Cardboard was wasteful and Tupperware "not so beautiful," she said. Thus, PieBox — made of pine from Michigan's Upper Peninsula, protective of even the fluffiest meringue — was born. While Blumthal has added an inch or two to the actual box design, her company is having a major growth spurt. 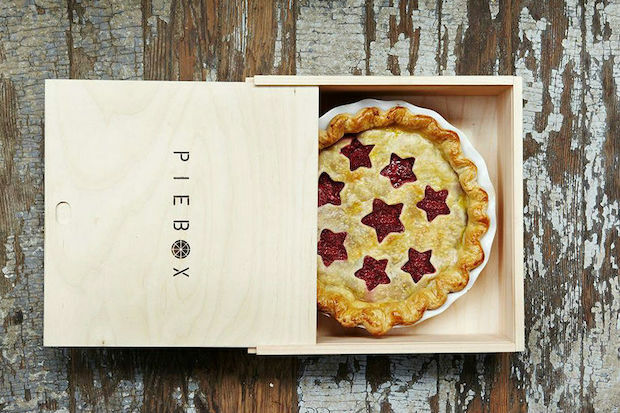 Last August, the cooking website Food52 added PieBox to its new online shop, Provisions. In January, Blumthal and company — which consists of her photographer husband Steve Metzer and her graphic designer sister Carol Blumthal — moved into a 2,400-square-foot facility at 4200 W. Diversey Ave. in the Pulaski Industrial Corridor. And in August, PieBox landed on the shelves and website of Crate and Barrel. "You should've seen us. We were like little kids at Christmas," Blumthal said of seeing an in-store display of her boxes alongside the Hoosier Mama Pie cookbook and jars of pie fillings. That first big boost from Food52 was followed by a mention in the New York Times right before Thanksgiving — the biggest pie holiday of the year. Stores and bakeries in 17 states now carry PieBox ($35), from gourmet heavyweight Dean & Deluca to the Snohomish Pie Co. in Snohomish, Washington, population 9,401. The boxes are for sale in the Martha Stewart American Made collection on eBay, and Blumthal contributes recipes and blog posts to the Martha Stewart website. In Chicago, Logan Square's Bang Bang Pie and Paperish Mess in Ukrainian Village sell PieBox. Blumthal continues to participate at the Renegade Craft Fair; the next one is Saturday and Sunday on Division Street between Damen and Paulina. Last year, she introduced CakeBox ($55), which can hold a 9-inch layer cake or 18 cupcakes. Optional leather carrying straps, made in Denver, are $28 to $32 depending on the size. While Blumthal said sales are strong, she hasn't yet reached the point of hiring full-time employees — or taking for granted the surreal feeling that comes with each box sold. "It's a cool thing," she said. "I still remember the excitement I felt at the first person I didn't know who purchased my product."